Monday 13th February 1995, is not a day Pierce Brosnan will forget. 'GoldenEye' had been shooting for almost a month, but this was the day that he had to utter the famous line: "The name's Bond, James Bond." "I am OK with the Vodka Martini line," he said at the time. "Because it's a drink I like and I genuinely order them. One of those sets you up for the night. Four of them and you're anybody's." "But saying 'Bond, James Bond" is another matter. I was there cleaning my teeth that morning saying it over and over again. I felt very foolish with toothpaste running all over my chin." "I have refused to say it in public or rehearsals because it's a line you can deliver in so many different ways. And I could trip up over it and I can imagine a situation where we're on the tenth take and my hands are starting to sweat." Brosnan nailed the line on the first take. 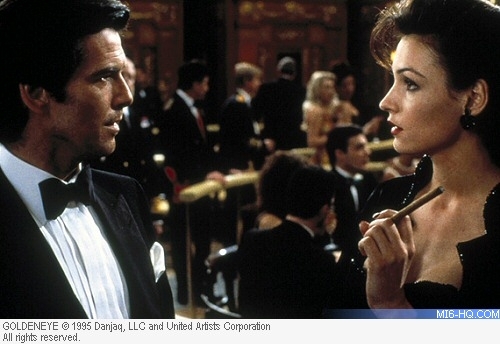 Pierce Brosnan reflects on having to deliver the famous line.